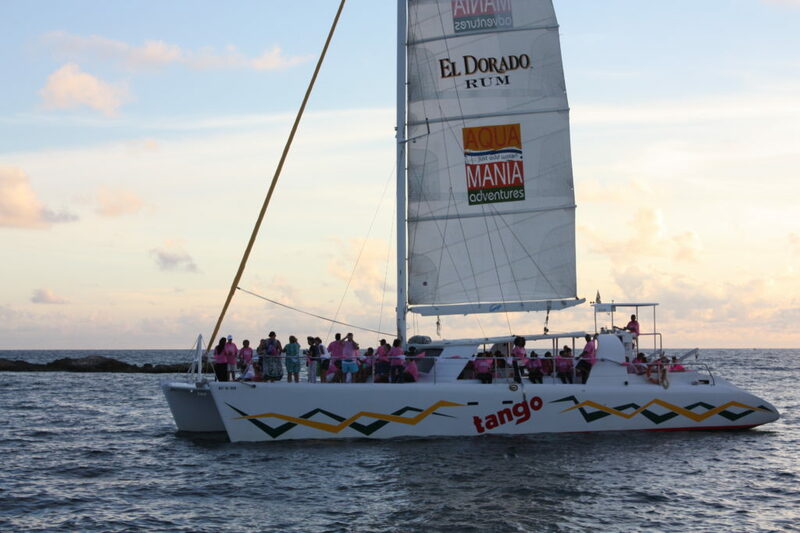 Friday October 2, 2015 – Simpson Bay, St. Maarten – The Pink Sunset Sail, organized by Aqua Mania Adventures to kick off Breast Cancer Awareness month, was a spectacular success. Over $2500 was raised by the event which is all being donated to the Positive and Elektralyets Foundations in support of breast cancer awareness. This was made possible by the generous donations of all 150 guests, who bought many raffle tickets to have a chance of winning fabulous prizes donated by local businesses. Aqua Mania Adventures added to the amount by donating proceeds of the Pink Sunset Sail tickets to both Foundations. 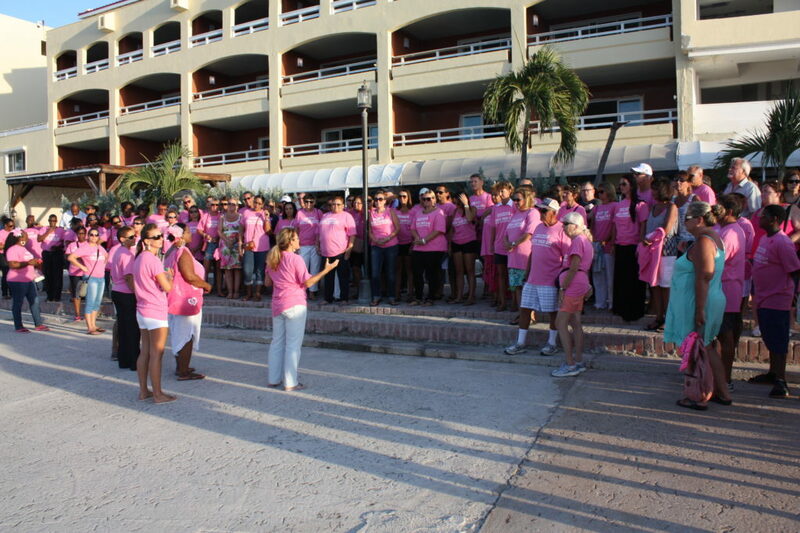 Upon arrival at Aqua Mania Adventures guests received a unique Pink T-shirt to get them in the spirit of the event. After a warm welcome on the dock to all 150 guests, where the General Manager of Aqua Mania Adventures thanked everyone for supporting the event, people were ready to board Lambada and Tango, the 65’ sailing catamarans that were made available for the event. “The gathering of all the guests in their pink shirts was very impressive to witness. It was particularly wonderful to watch the mixture of our guests consisting out of island visitors and residents, everyone wanted to show their support. We can’t thank our guests enough for making such an incredible contribution to this important cause.” Said Michele Korteweg from Aqua Mania Adventures. Once on board radio celebrities Soc and Elektra informed the guests of how early detection can save lives, and the importance of supporting the Positive and Elektralyets Foundations in this cause as they fund the free screenings that are available on island the whole month of October. “The event was organized to raise awareness for a disease that affects so many of us, directly or indirectly. 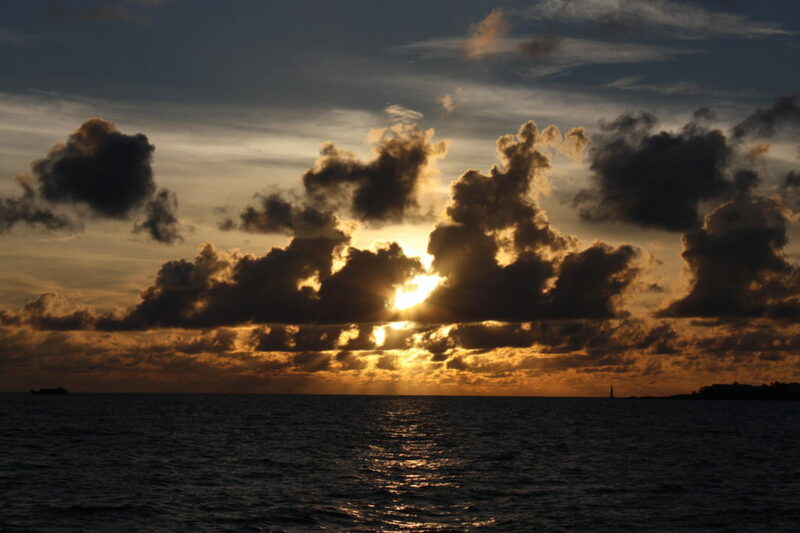 However, the goal was for everyone to have a wonderful evening out on the water by enjoying a beautiful coastal sunset sail. This informal setting would make people feel comfortable to openly converse about breast cancer, their personal experiences or to offer comfort. And indeed these types of conversations took place, but mainly the evening was filled with smiling faces.” Korteweg continued. 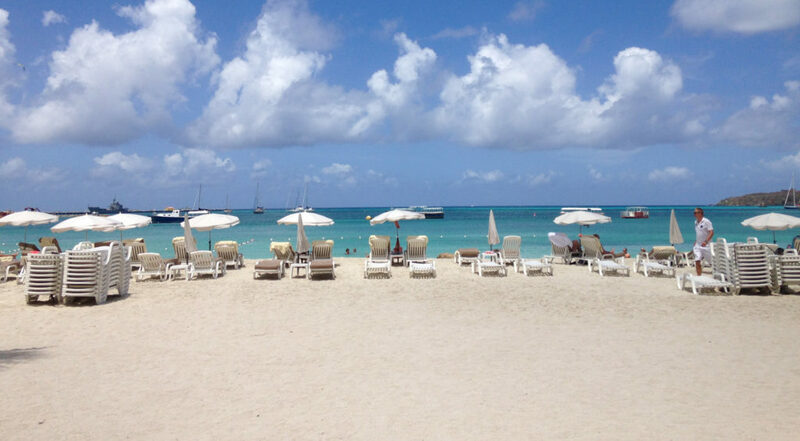 People enjoyed a stunning sunset, pink mimosas, snacks and music while cruising the stunning coastline of St. Maarten. The highlight of the evening was the raffle, made possible by donations from many local businesses. Lucky winners won hotel stays at the Simpson Bay Resort, Divi Little Bay Resort, Summit Resort and the Westin. Also many guests went home with a variety of gift certificates from restaurants, like Pineapple Petes, Sushiitto, Temptation, Bamboo Bernies, SkipJacks, Sint Maarten Yacht Club Restaurant & Bar, Bistro Caraibes, Ocean Lounge and Karakter. There were also some jewelry items from Splash Jewelers and Caribbean Gems, a massage from Good Life Spa, a half day sail on Sail la Vie from the St. Maarten Sailing School, bicycle tours with TriSport, gift vouchers for Grand Marche, Domino’s and the Simpson Bay Pharmacy, goody bags from Island Water World, electronics from Keijzer Computer Systems and a smart phone and headphones from UTS. There were also some remarkable donations, like the Moet & Chadon rose champagne, a personal donation from employees working at Caribbean Liquors & Tobacco and the printing of posters by the Mailbox. The Positive and Elektralyets Foundations have a full calendar of events to raise awareness for breast cancer for the month of October. In addition there are free screenings at locations all over the island during the month. Early detection can save lives, therefore it is important to go to a clinic for a yearly screening and do regular self-examinations. 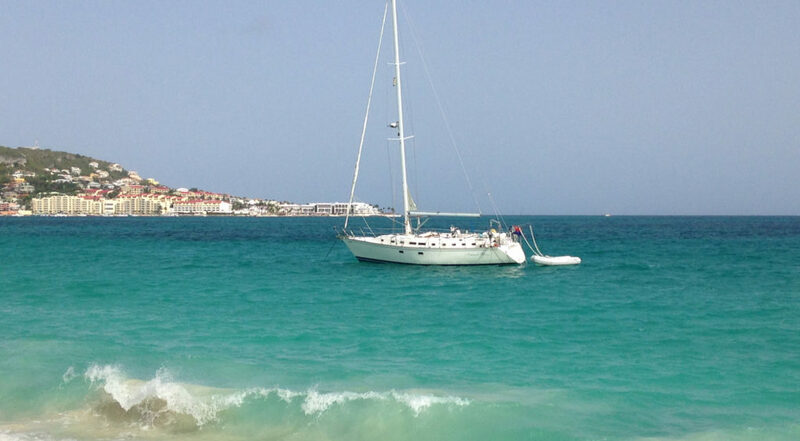 Aqua Mania Adventures is a water sports company with over 20 years of experience in the customer service industry and friendly and reliable staff that offers daytrips to all destinations (Anguilla, Saba and St. Barths), has all the toys for water sports and runs a professional and well established dive center. The Positive Foundation, inaugurated in 1998, organizes month long, annual breast cancer awareness campaigns. Each year, in October, activities include public service announcements via radio & TV called “Women and Breast Health”, a breast cancer awareness run/walk challenge, free clinical breast examinations screens offered by our resident health care providers, public and private group information demonstration sessions on self-breast examination & the distribution of educational literature like” Breast Self-Examination Shower Guides” and “Women and Breast Health Handbook”. ELEKTRA L.Y.E.T.S. : (Let Your Electricity Touch Somebody) is the basic core and fundamental reason for this foundation with the perspective that every person in this community can make a difference starting with themselves and in turn helping others through their virtues, gifts, talents and intellectual abilities.